The Speed and Strength Bikes Are In My Blood Boots, new for 2016, are Speed and Strength's answer to a growing demand for Harley and V-Twin styled boots. They have an attractive work-boot style made from premium leather, along with toe and ankle reinforcements for protection. Size zippers mean taking these boots on and off will be a cinch, and the anti-slip rubber outsole will keep you firmly planted. 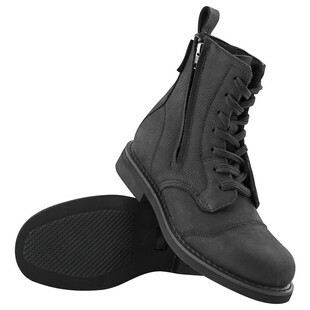 The lacing system is streamlined and simple, further adding to this boot's ease of use. It looks like Speed and Strength is entering the V-Twin boot party with a solid, inexpensive pair of clodhoppers.